Sakurayu (桜湯) or cherry blossom tea is a Japanese infusion created by mixing pickled cherry blossoms with boiled water. This combination becomes a type of tisane, and has been enjoyed in East Asian culture for many generations. The main ingredient, cherry blossoms petals, are harvested when the cherry trees bloom from mid to late spring. After the calyxes are removed, the petals are then pickled in plum vinegar & salt and the product subsequently dried. The dried cherry blossoms are then stored or sealed in tea packets and sold. Batsford Arboretum in Gloucestershire (England), holds the national collection of Japanese village cherries, sato-sakura group. Keele University in Staffordshire (England), has one of the UK’s largest collections of flowering cherries, with more than 150 varieties. Branch Brook Park in Newark, New Jersey is the oldest county park in the United States and is home the nation’s’ largest collection of cherry blossom trees, with about 4,300. 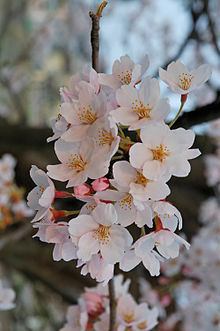 Japan gave 3,020 cherry blossom trees as a gift to the United States in 1912 to celebrate the nations’ then-growing friendship, replacing an earlier gift of 2000 trees which had to be destroyed due to disease in 1910. These trees were planted in Sakura Park in Manhattan and line the shore of the Tidal Basin in Washington, D.C. (see West Potomac Park). 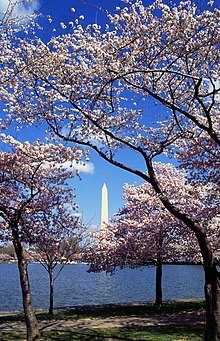 The first two original trees were planted by first lady Helen Taft and Viscountess Chinda on the bank of the Tidal Basin. The gift was renewed with another 3,800 trees in 1965. The cherry blossom trees continue to be a popular tourist attraction (and the subject of the annual National Cherry Blossom Festival) when they reach full bloom in early spring. Also, Balboa Park of San Diego has 2,000 cherry blossom trees that blossom in mid to late March. In Los Angeles, over 2,000 trees are located at Lake Balboa in Van Nuys. These trees were donated by an anonymous Japanese benefactor and were planted in 1992. They originated from a single parent tree and were developed to grow in warm climates. 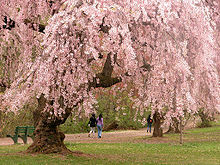 Philadelphia is also home to over 2000 flowering Japanese cherry trees, half of which were a gift from the Japanese government in 1926 in honor of the 150th anniversary of American independence, with the other half planted by the Japan America Society of Greater Philadelphia between 1998 and 2007. Philadelphia’s cherry blossoms are located within Fairmount Park, and the annual Subaru Cherry Blossom Festival of Greater Philadelphia celebrates the blooming trees. The University of Washington in Seattle also has cherry blossoms in its Quad. Other US cities have an annual Cherry Blossom Festival (or Sakura Matsuri), including the International Cherry Blossom Festival in Macon, Georgia, which features over 300,000 cherry trees. The Brooklyn Botanic Garden in New York City also has a large, well-attended festival. Portsmouth, New Hampshire, is the site of the peace conference that produced the Treaty of Portsmouth, for which the original Washington, DC cherry trees were given in thanks. Several cherry trees planted on the bank of the tidal pond next to Portsmouth City Hall were the gift of Portsmouth’s Japanese sister city of Nichinan—the hometown of Marquis Komura Jutarō, Japan’s representative at the conference. The park was originally called Claremont Park after the avenue on its east side, but renamed in 1912 after the Committee of Japanese Residents of New York donated 2,500 cherry blossom trees to the city. The land, originally owned by John D. Rockefeller and purchased by the City of New York for use as an extension of Riverside Park, was landscaped with financial support from Rockefeller, over a two-year period starting in 1932. Directly to the east is Claremont Avenue, which is dramatically lower in elevation, and resulted in a buttressed retaining wall being built during the period that extends the length of the park. In 1960, another gift was given to the park, this time by the City of Tokyo in the form of a tōrō, when New York became her sister city. Former Crown Prince and current Emperor of Japan, Akihito, was in attendance during the official dedication on October 10 of that year. Crown Prince Akihito would later rededicate the tōrō with his princess in 1987. How can I get my own cherry blossom tree? The National Cherry Blossom Festival, in conjunction with Arbor Day Foundation, has cherry blossom trees available for purchase. Here are the details. Along with some other answers to National Cherry Blossom Festival questions. $12; students & seniors $10; Japan Society members and children under 16 free. Admission is free to all on Friday nights, 6 PM–9 PM. Japan Society Gallery is currently closed, and will reopen on Saturday, March 9. The National Cherry Blossom Festival Opening Ceremony with be held on March 23 from 5 – 6:30 PM at the Warner Theatre, located at 513 13th Street, NW, Washington, DC, 20004. The Opening Ceremony is a free and open to the public event, however reservations are required. To reserve your tickets, click here. Monday morning the National Park Service announced this year’s “peak blossom” prediction via Twitter — and, great news, the dates coincide with the festival. Celebrate the kite tradition of Southeast Asia. Experience the artistry and beauty of Asian kites, see indoor kite flying, make your own kite and enjoy other hands-on activities! The Blossom Kite Festival includes 5 areas to enjoy: the Competition & Demonstration Field, Family Field, Kite Club Display Area, Activity Tents, and Public Field. To view a map of the areas, click here. (The page link below includes the full list of scheduled events and competitions throughout the day) – amazing and looks like fun, too. Minneapolis, New York, Philadelphia, San Francisco and Washington, D.C.
says Robin Hall, the producer of the show. millions of live flowers, plants and trees from around the globe. will be open during regular store hours. Includes a number of events, flower designers, fashion shows, cherry blossom events, bouquet of the day by top floral designers, culinary wizardry and celebrity appearances. Did not note if that is at each store involved (the flagship stores listed) or at one to kick off the show. Would be fun to see it – probably will be amazing. Japanese Chamber of Commerce and Industry of New York, Inc.
JCCI and the Nippon Club will hold a HANAMI event on Thursday, April 11, 2013. In Japan, the blooming of cherry blossoms is an occasion for celebrating the beauty of the changing seasons. Experience a taste of Japanese spring in New York at this special event, which will feature a delicious Japanese buffet dinner, all-you-can-drink sake, traditional hanagasa dance, and koto (Japanese harp) music, performed by Masayo Ishigure of the Sawai Koto Academy of Music. There will also be a raffle and the chance to win several prizes, including a grand prize of Delta Airlines tickets. This will be a wonderful opportunity to celebrate the end of a long winter, and enjoy Japanese culture with the Japanese and American business communities in New York. Please feel free to invite family and friends to take part in the festivities. * Early registration is recommended as seating will be limited. Japan’s Top 100 Cherry Blossom Spots for viewing Cherry Blossom sorted by prefecture. Guide to Japan’s Top 100 Cherry Blossom Spots include descriptions, pictures and map. The trees normally bloom between late March and early April, though extreme hot or cold temperatures have caused blooms as early as March 15 and as late as April 18. Wines generously provided by Brooks, Cognac One, LLC, and Turquoise Life, LLC. The list includes links to each of the shows’ organizers for more information – very nifty.